Firefighters are keeping a "watching brief" after a blaze on the largest national nature reserve in the south-east of England. 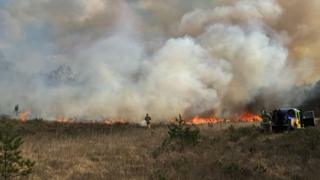 The fire at Chobham Common in Surrey was discovered and reported by wildlife workers at about 11:30 GMT on Monday. Crews from multiple counties joined forces to battle the flames but it quickly spread to about 30 hectares. Surrey Fire & Rescue said officers remained at the scene on Tuesday morning, damping down hotspots. A spokesperson said the cause of the fire was unknown but was not believed to be deliberate. He said off-road specialist vehicles would remain on the common for at least a few hours to ensure it was in a safe condition. All roads are now open but the fire service urged members of the public who may be thinking of visiting any area of outstanding natural beauty to be vigilant and careful about any actions that could cause fire. As crews tackled the blaze on Monday, a yellow wildfire alert was issued for the UK, denoting a moderate risk of wildfires.